Fear is a powerful sensation; it can be a great asset or hold you back. Use it as an alert system: it signals where you need to put attention, loose ends that need to tie out, or weakness in your plan or product. Once you’ve gotten the signal, focus on it directly and let go of the uncomfortable sensation. This week try listening to fear as a source of wisdom, then write down the signal and your response plan to address whatever triggered it. Does prompt attention to the signal relieve the stressful aspect, clear your mind and catalyze you forward? 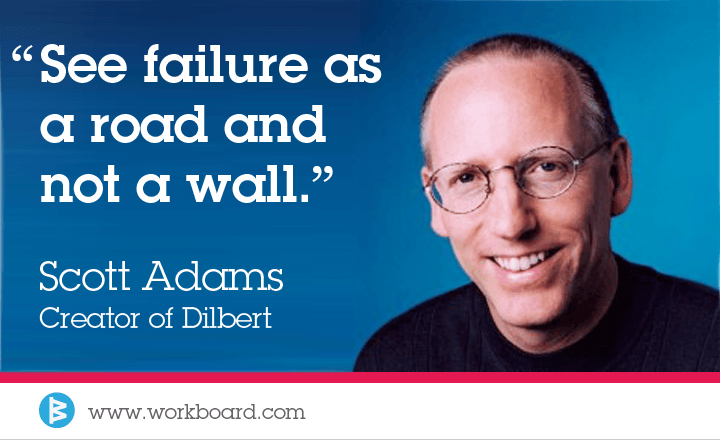 Teams that fear failure and its consequence deliver mediocre results over time. This happens because they work and are rewarded for predictable outcomes and not for reaching beyond certainty toward possibility — how do you react when they fall short? To empower your team to achieve beyond expectations, create a regular vocabulary and process for defining committed outcomes and stretch objectives week over week. A recognition system that celebrates achievement of commit goals and the stretch even when the goal is not achieved will inspire your team to go beyond predictable to impressive results. We hope this helps you build velocity. Be fearless this week! P.S. If you’re putting these tips to work this week, capture your plan of action and the teams’ commit and stretch goals in WorkBoard. It will be easier to communicate, track from staff meeting to meeting, execute plans and recognize great performance.